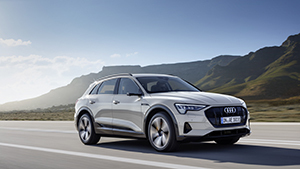 With the fully electric e-tron, Audi has something completely new in store for devotees of Vorsprung durch Technik, and the Buckinghamshire new town of Milton Keynes is to provide a highly appropriate shopfront from which the new SUV can make its inaugural UK public appearance. Famed above all for its plentiful roundabouts and abundant shopping opportunities, the town can lay claim not only to being the UK home of Audi, but also one of four key locations chosen by the UK Government to spearhead vehicle emissions reduction initiatives as part of its Go Ultra Low Cities programme. The versatile new five-seat e-tron eschews conventional fossil fuel combustion in favour of two powerful, zero emission electric motors delivering sub-six-second 0-62mph acceleration and a driving range of at least 248 miles*. It is a fitting Go Ultra Low standard bearer, and accordingly will briefly take pride of place in the Electric Vehicle Experience Centre funded by the Government’s £9 million investment in the scheme and located in Crown Walk in the town’s famous Grade II listed shopping mall. The ‘EVEC’ is described as ‘the UK’s first brand-neutral centre for electric and plug-in vehicles’. It showcases the latest models from a range of car manufacturers, and not only offers impartial, no-obligation advice on making the switch to hybrid or full EV power, but also the opportunity to gain first-hand experience of the technology during short test drives, with the option to request longer-term test loans of up to seven days. The Audi e-tron will occupy a front-of-house position in the EVEC from Friday 19th of October through to Sunday the 21st of October, and ‘EV gurus’ will be on hand to answer questions on this milestone Audi model. The technology behind the brand’s first ever zero local emissions model is centred around a high-voltage 36-cell battery mounted beneath the passenger compartment which feeds the electric motors positioned on each axle. The 95kWh battery is chargeable at fast charging stations with direct current (DC) at up to 150 kW – a first for a series-production car - meaning that it can be replenished to 80% of capacity in as little as 30 minutes. Recharging at home with alternating current (AC) is of course also possible, and is particularly efficient when a home wall box is installed. The electric motors not only facilitate a driving range of at least 248 miles*, but by being positioned on each axle also ensure that their strong output of up to 300kW is delivered with trademark Audi composure by operating as an electric all-wheel drive system. This works in favour of the smooth transition of the 664Nm of torque to the wheels, making a 0-62mph sprint time of just 5.7 seconds easily achievable for the spacious SUV. The more immediately evident technology on board the new Audi e-tron is no less slick. It primarily consists of two large MMI touch response displays with haptic feedback and voice control familiar from the latest A6, A7 Sportback, A8 and Q8 models, complemented by the fully digital Audi virtual cockpit, MMI navigation plus and internet-based Audi connect infotainment services. Combined with comprehensive comfort features, high-quality materials and exceptional workmanship, these advanced systems make travelling under Audi electric power a suitably premium experience. continue pushing back the boundaries of the technology. The Audi e-tron is set to open for order in the UK in early 2019 with an RRP of £70,805. UK customers are able to secure priority access to the car through the payment of a £1,000 deposit to their local Audi Centre or via e-tron | Audi UK.